Should Towel Snakes Take Over? I’ve heard that people saving chairs and things others might want to use sometimes creates a problem on cruise ships. Particularly on transatlantic cruises where rumor has it they save everything from deck chairs to tables on the lido deck and even seats for the shows. While all this saving is not technically allowed, the “in the bathroom” excuse works in spite of the fact that 60 people would not fit into one bathroom, and it happens to be empty anyway. Since we don’t tend to hang out in those areas that much, we haven’t ran into the issue too often, with the exception of the hammocks on the Serenity deck, which had a total of only 4. One day we went up to the Serenity deck thinking a bit of time on the hammock might feel quite relaxing after a spell in the hot tub. The hammock next to the hot tub sat empty, but not wanting to be selfish we put our towels and things on some distant deck chairs of which none were in use. Before we even got back to the hot tub some random guy set his things on the hammock and proceeded to get into the hot tub. We spent some time in the hot tub while other people came and went, many of them sadly looking at the hammock occupied by someone else’s towels. When we got out, hammock hog stayed in the hot tub. The hammock on the far end away from the hot tub became available so we laid there for awhile. After we got up to return to our room for hot showers, the other hammock remained occupied only by towels, with hammock hog still in the hot tub. Other visits to the serenity deck often found the hammocks all taken, and usually at least half of them by nothing but towels. Perhaps “no saving” signs posted and enforced would help prevent people from using deck furnishings as towel racks for long periods of time, barring many disappointed passengers from their use. If crew collected towels left unattended for longer than half an hour and passengers missing said towels had that charged to their room it could put a quick end to that practice. It’s kind of a no win situation for the crew though, do that and irritate the savers, don’t and leave everyone else with nowhere to go. I think the amenities the ship has to offer should be available for all passengers though, and not just the selfish few who think the rules don’t apply to them. If the crew doesn’t enforce no saving rules, what are the other passengers to do? We have a transatlantic cruise booked for the somewhat distant future. I’ve began to wonder, what if the whole saving things situation is really as bad as I have heard? If random towels spend more time using the facilities than actual people do, would it be better if it at least looked as if the towels were having a good time? 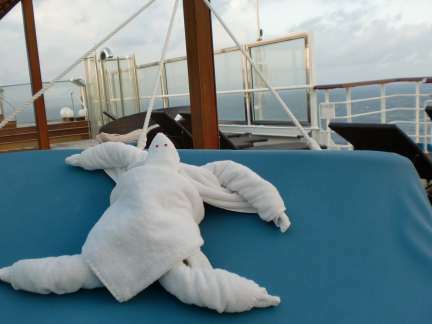 What if instead of towels thrown over deck chairs, someone folded any towel left unattended for long periods of time into a towel animal so it at least appeared to have fun? 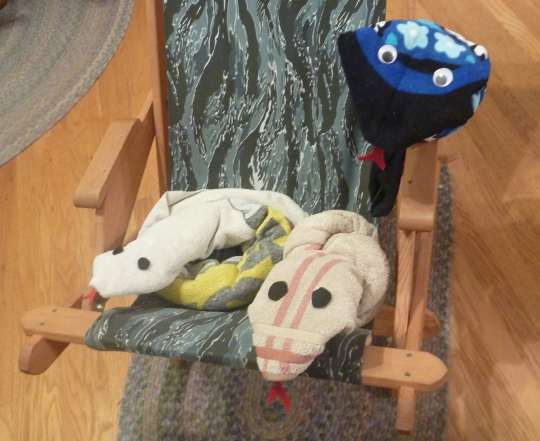 Most towel animals require more than one towel, but not snakes. 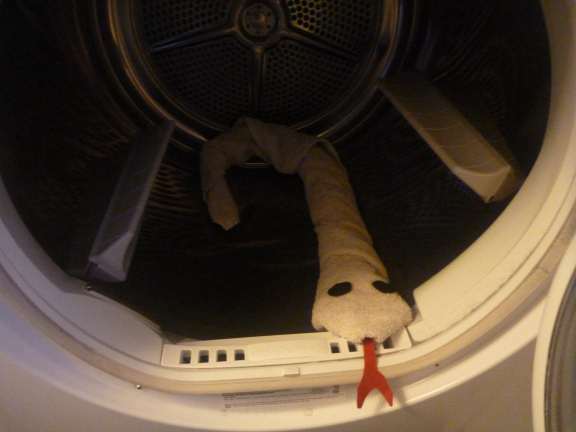 It takes just one towel to make a snake. (And conveniently enough finding a snake when they return just might also suggest something to a person who would reserve a deck chair or hammock for hours on end while they were actually somewhere else.) Would it be less annoying to see a flurry of towel snakes using whatever it is you wanted to use rather than haphazardly strewn towels all over the place? Make sure to click the vote button after choosing your answer to register your vote and see the results. Click link for blogs with directions on how to fold towel animals. 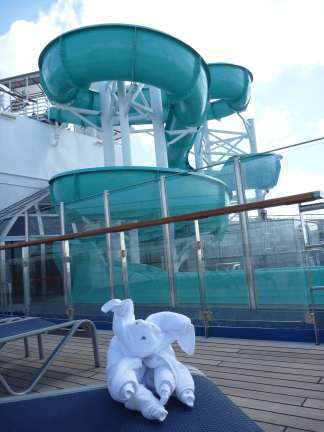 This entry was posted in Randoms, Shipboard Life, Towel Animals and tagged cruise, funny, humor, people, poll, saving chairs on cruise ships, towel snakes, towels. Bookmark the permalink. 6 Responses to Should Towel Snakes Take Over? 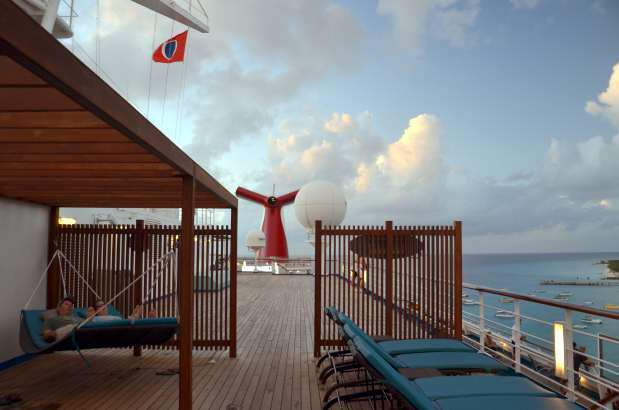 Where is your transatlantic cruise going? Spain to Miami, with stops at Canary Islands and in the Caribbean. We’d love to do a transpacific, Seattle to Sydney sometime. I haven’t seen too many of those offered though. The percentage for “Yes because it’s funny and everyone likes towel animals” is in the beach where you can’t read it. That was what I voted for too. If you click on view results you can see it clearly.